As a fashion blogger, I feel like there is so much pressure to go, go, go at a million miles per hour. Planning content to coincide with holidays and seasons means we are always operating in the future. There’s a definite pressure to highlight every sale, celebrate every “national Instagram holiday”, grab the latest trend before it sells out… ultimately, this pressure to keep up leaves me feeling drained, uninspired, and in a word… basic. I know this pressure doesn’t extend to only fashion bloggers. You mamas out there feel it too, I know. Instagram provides a curated window into everyone else’s lives and it can leave us feeling behind, desperate, and even like we are failing. Always focusing on what’s to come and being ready for the next thing often renders us unable to celebrate the here and now. I know this is a weird segue, but I feel that right now this is highlighted most strongly by the blogging community’s laser focus on the Nordstrom Anniversary Sale. Like, I get it. Stocking up early is just a smart decision. I love the sale, am excited to round it up for you and promote my favorite pieces. We all want a great deal. We want to score Tory Burch riding boots at a $200 discount. But, like, I don’t want to see you wearing your Tory Burch riding boots right now, on this 99 degree July day. I want to see them in September. With the sale still going strong, I feel like everyone suddenly has fall fashion on the brain. My IG feed is basically full of babes wearing sweaters and leather jackets and I’m just like, GIRL, it is 100 degrees here. I can’t even fathom a sweater right now. While I think stocking up on fall pieces during the sale is smart, ultimately, I think let’s wait until September to start breaking out the fall fashions, right?? As for me, until the temps drop, (HAHA as if that’s even happening here!) I’m focusing on my favorite summer trends. I’m going to say, you know what, I want to focus on NOW. And NOW it is 99 degrees. So I will be wearing my new gingham mini dress, thanks. This ruffled mini dress just sort of called out to me. 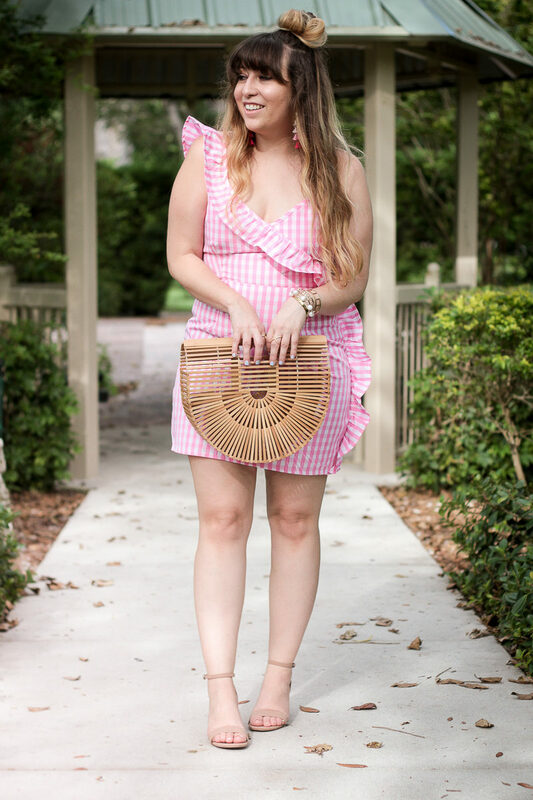 I love the sweet ruffle, the pretty gingham print, and duh the fact that it’s pink. It’s also only $32! I feel like the fit is super flattering and I just love this cute little number. I had my eye on these amazing Baublebar tassel earrings for awhile and finally took the plunge, scooping them up in both pink and blue ombre. Thank you so much for reading! I’d love to know– what do you think about this hyper focus on speeding up the seasons? Are you feeling stressed with the sudden fall focus? Or are you into the inspiration? I know a lot of you are bloggers as well. What do you think? Do you feel pressure to move on to the next? Hit the comments and let me know.